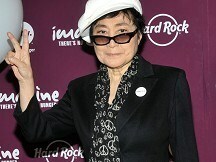 Yoko Ono says John Lennon's iconic Imagine was not initially embraced by the public. She says the song, released in 1971, "was not really accepted ... it wasn't 'Wow!'." Yoko, who is listed as a co-producer on the track, says she remembers when Lennon created it, calling that time "really beautiful". Lennon's 78-year-old widow made the comments at the launch of Hard Rock and WhyHunger's Imagine There's No Hunger campaign in New York City's Times Square. The global campaign aims to raise money and awareness for childhood hunger and poverty in Africa, Asia and Latin America. In 2004, Rolling Stone magazine ranked Imagine at number three on its list of The 500 Greatest Songs of All Time. Yoko Ono says John Lennon's iconic Imagine was not initially embraced by the public.She says the song, released in 1971, "was not really accepted ... it wasn't 'Wow!'. Rihanna was forced to cancel a show in the Swedish city of Malmo at the last minute last night after falling ill, organisers said.